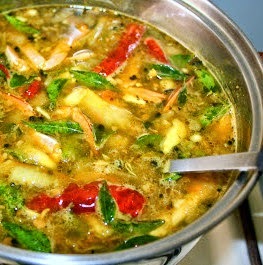 Indian Crab Soup, aka Nandu Rasam. Yes, crab claws or legs into this Indian soup. Remember the humble plain and simple Rasam I have already shared with all of you? That's right. Of course, we shouldn't doubt the humbleness and simplicity of plain rasam, but trust me, crab claws or legs, no matter how big or small they are, they do pretty much elevate rasam to a higher above level. The double doze of double packing healthy power as a remedy for cold and flu or maybe even other benefits as well maybe. Anything else should I say? I guess not. 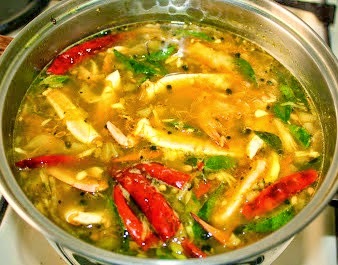 Except, you should give a go this my version of Indian Crab Soup/Nandu Rasam. *Soak in water for 10 to 15 mins. Drain water from spices and pound roughly in a mortar. Pound again for a coarse paste. Now, put in crab legs in the same batu tumbuk/mortar and pound to lightly crack them up. In heated oil, add pounded spice mixture, crab legs and tomato. Stir for 3-4 mins over low heat until legs are light reddish. Add curry leaves, dried chillies, mustard seeds, turmeric powder and salt. Stir, pour 1 litre water and tamarind juice. When rasam is heated through, remove from heat.